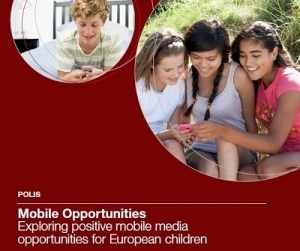 As Polis launches its latest research report ‘Mobile Opportunities’ by Dr Jane Vincent, Professor Sonia Livingstone gives some background to the report. The more children go online, the more it seems that we all – parents, teachers, policy-makers, and certainly the mass media – focus on the risks that the internet seems to bring into children’s lives. These risks are, indeed, a significant cause of concern, as the EU Kids Online network has researched for some years now. But we’ve always argued that the opportunities are equally important. Indeed, they are, of course, why parents and schools provide access to internet-enabled devices to their children. So when Safer Internet Day 2015 announced its theme is a positive one – “Let’s create a better internet together” – I wanted to pull together the positive findings from our European research. • Privacy and personalisation. With the miniaturisation of mobile devices it becomes even more possible to view or read in even more private places. This means that children are more able to create their own personal connection to the internet away from public oversight or control. This could provide fertile possibilities for children to explore, experiment and create. Or it could harbour more risks. Much depends on parents, teachers and, as I suggest below, content providers also. • Inequalities in opportunities. As the EU Kids Online “the ladder of online opportunities ” shows, opportunities do not automatically result in benefits. 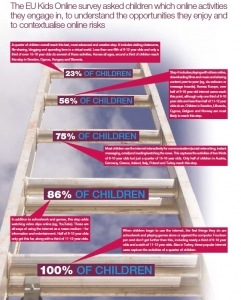 For many children start on the bottom rung of the ladder but not all climb very high. This depends partly on age (so we can expect children to gain more benefits as they get older), but that doesn’t make for good news for the youngest kids now getting online. Also important, however, is that children from poorer homes are less likely to gain the benefits than those who are more privileged. Perhaps this is where we need teacher to give everyone a fair chance of the great possibilities the internet can offer? If we want better for our kids, I suggest that content providers may need to be more imaginative in developing great content for our kids (I offer some ideas in a recent interview , itself part of a wonderful guide for positive content for kids). • Being Protected and Private. What’s striking is that this moves us away from the tired rhetoric of children as ‘digital natives’ towards seeing how they are innovating socially – finding new possibilities to engage with digital media and contents within their peer groups, and thereby gaining new kinds of value and recognition. My hope is that future research – along with the initiatives that Safer Internet Day 2015 will celebrate – will enable adult society to think more positively about how children are using the internet today, and then work with them to better support more imaginative uses for the internet tomorrow. This article was written by Professor Sonia Livingstone.